Whether it’s a tornado hitting the Midwest or a hurricane warning in the South, an earth quake jolt in the West, or a forest fire spreading quickly, being prepared can help you tackle any disaster with equanimity. Being prepared is especially important if you are a vegetarian since emergency food options are limited and you might end up eating meat products or nothing at all. Survival Warehouse Vegetarian MRE meals are the best vegetarian emergency food option you can buy. Vegetarian MRE meals have constantly been rated as the best survival food, packing nutrition with taste to provide a wholesome energy packed vegetarian meal for you and your family. With each vegetarian MRE Case, you receive Vegetarian Entrée of 8 ounces, a Drink mix and 2-3 Sides along with a pack of accessories and each complete meal amounts to approx. 1100-1300 calories. All vegetarian MRE meals are Ready to Eat but at Survival Warehouse we strive hard to ensure you get the best tasting meals, which is why 12 MRE Full Case Vegetarian Meals come equipped with 12 MRE Heaters for fast and easy heating with no power needed. 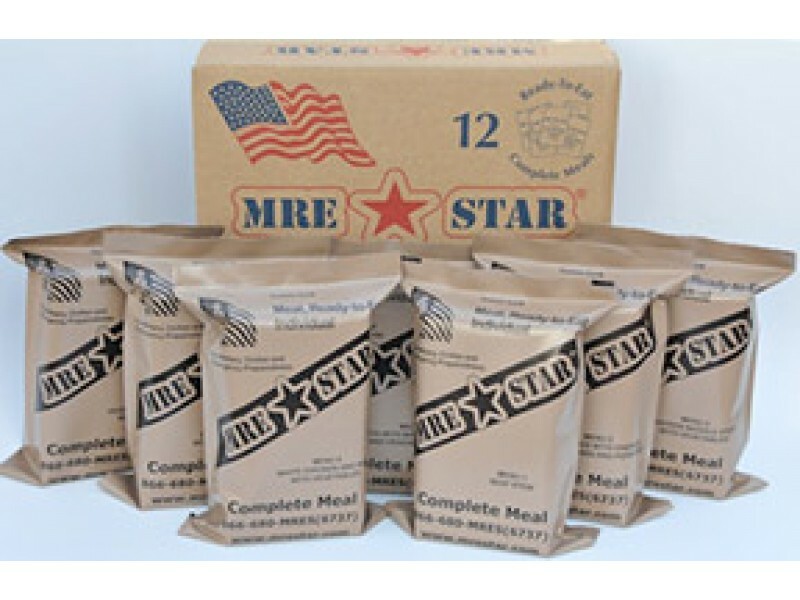 STAR Vegetarian MRE meals are designed to appeal to even the most fussy eaters as well as family members with special needs. 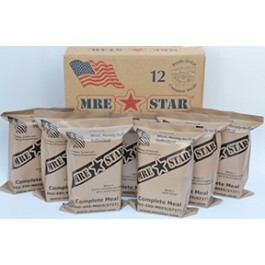 STAR MRE’s help ensure you have the best vegetarian MRE survival food at hand for your family. The best vegetarian MRE meals are those that require no preparation for eating, MRE’s can be easily stored and opened up and can be eating without being messy as cleaning up in a emergency is not an easy task. Survival Warehouse offers the STAR vegetarian MRE meals do just that and more, easily a big hit with all family members because of their great taste and high nutritional value. Even our MRE sides are nutritional snacks by themselves and help keep your young ones active and happy in times of scarce food supply. With Survival Warehouse’s Vegetarian MRE Meals, you never need to despair again about keeping your family fed and happy in difficult times. Our 12 MRE Case of Vegetarian Meals with Heaters is all you and your family needs to make even the most difficult days seem like a breeze. One case of MRE’s is 12 meals and lasts one person four days. 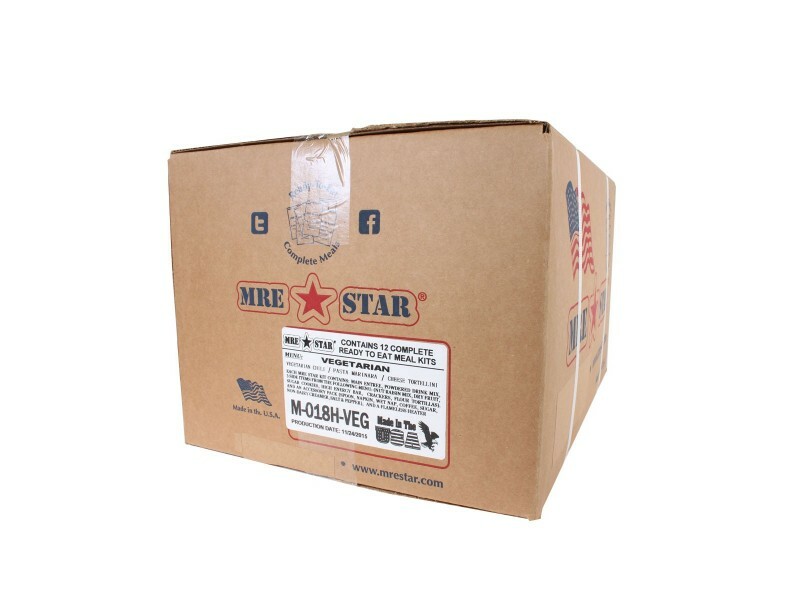 If you buy two or more Vegetarian MRE food cases we give FREE SHIPPING in the lower 48 states. Sides items could be any of the following: nut raisin mix, dry fruit, sugar cookies, high energy bar, cracker or tortillas. Accessory packs include spoon, napkin, coffee, non-dairy creamer, sugar, salt, pepper and a wet nap. Each complete meal contains an 8 ounce entree, 2-3 sides, a drink mix, and an accessory pack for a total of 1100-1300 calories per complete meal. A complete case will contain 13,200-15,600 calories. The case includes 12 meal heaters.